Fabrication Services are a general group of manufacturing services that use welding, bending, cutting, and a host of similar techniques to produce weldments, structures, etc. in metal, foam, plastic, etc. In metalworking, the term fabrication has particular meaning. A fabricated part is constructed from standard steel or aluminum channels, angles, plates, and bars and then welded to produce a single item, often called a weldment. Sheet metal fabricators likewise cut, bend, and seam sheet metal to form transitions, ducting, cabinets, etc. Structural steel fabricators cut and weld I-beams and the like to produce overhangs, stairways. etc. Other metal fabrication services include metal spinning and hydroforming. Fabrication services also pertain to materials such as composites, rubber, ceramics, and so on. Fabrications in these instances generally mean articles that are assembled from various standard shapes rather than custom molded, etc. Metal Fabrication pertains to the manufacture of weldments such as frames and bases for heavy machinery, etc. and involves cutting, bending, punching, etc. Sheet Metal Fabrication uses cutting, bending, rolling, etc. to produce guards, enclosures, etc. from metal sheet. Ceramic Fabrication uses sintering, pressing, etc. to manufacture heat resistant products from ceramics such as alumina and silicon carbide. Composite Fabrication develops platforms, panels, and the like from composite materials such as epoxy and carbon fiber. Foam Fabrication uses sawing, die cutting, etc. to create packaging, seat cushions, and the like from stock foam materials. Glass Fabrication produces mainly blown glass components from quartz and other laboratory glasses. Metal Spinning forms a variety of hollow, cylindrical items such as cooking wares from usually soft metals such as aluminum. Plastic Fabrication produces plastic tanks, hoods, etc. from stock plastic shapes such as rods, sheets, etc. Rubber Fabrication produces bumpers, blast pads, and similar products from stock rubber profiles as an alternative to molding. Tube Fabrication bends tubing for hydraulics, architectural structures, etc. and often adds supports, flanges, etc. to the fabrications. Wire Forming (Fabrication) creates wire shapes such as clips and wire assemblies such as baskets by cutting, bending, welding, etc. from bulk lengths of wire. Hydroforming is a die forming technique that uses high pressure hydraulic force to shape panels, tubing, etc. into often intricate forms. 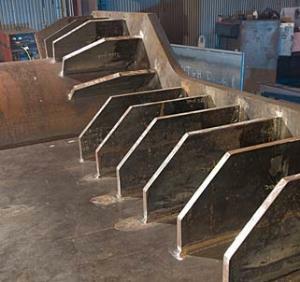 Structural Steel Fabrication modifies structural steel shapes such as I-beams into structural shapes often for civil and architectural purposes.